Facebook is an important part of our daily lives. It’s fun connecting to the rest of the world, thus reacting and sharing posts. However, be aware that our entire Facebook search history gets stored which can either prove to be risky at a later stage. Well, you don’t know. So, what do you think happens with our Facebook search history? Why is it necessary to clear our Facebook search history at times? No matter what, how to clear Facebook search history in the first place? What Happens With Our Facebook Search History? Do We Need To Delete Facebook Search History? 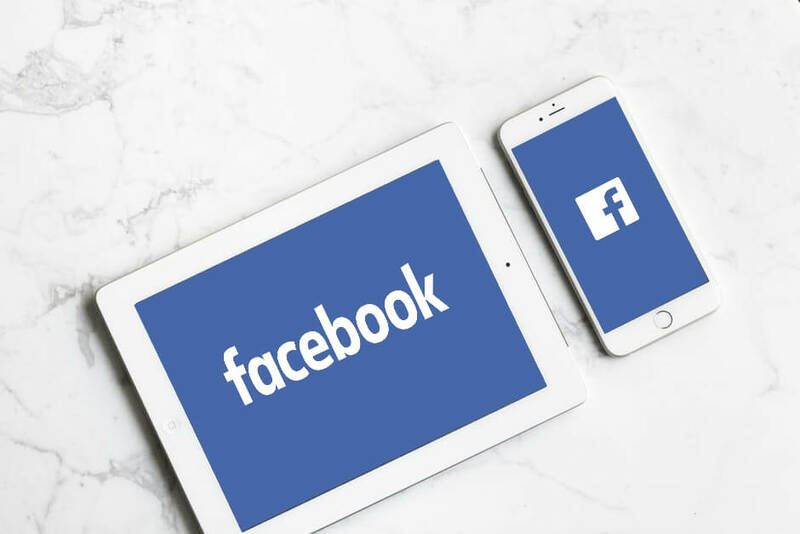 How To Clear Facebook Search History From Your PC? 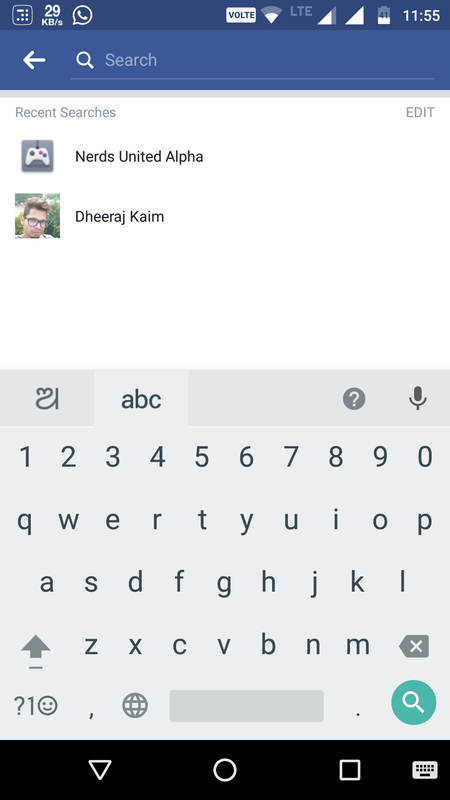 How To Clear Facebook Search History On Android? 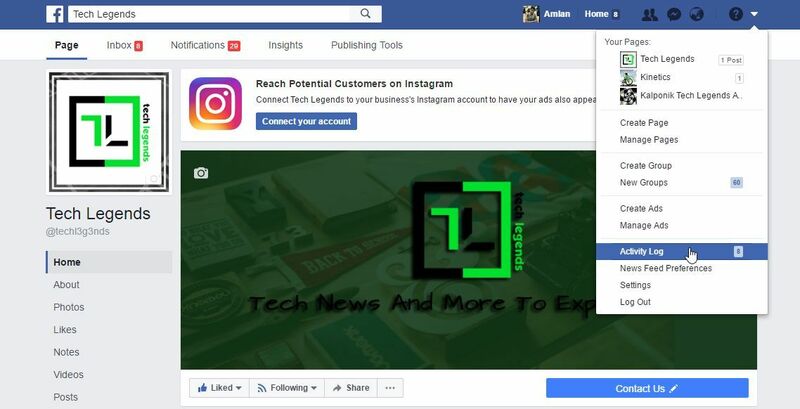 For efficiency reasons, Facebook stores our recent searches and hence, whenever we attempt to use the Facebook search bar, our very own recent searches pop up as a drop-down list. This not only helps us to tap on to our frequent search results but also gives Facebook the full liberty to provide us with a hassle free browsing experience. So, why should we be concerned to clear facebook searches? That’s an important question to be answered. What if your dearest friend or sibling has access to your Facebook account and finds out your crush’s name popped up in the search results? It can be either scary or embarrassing, or maybe simultaneously both! Well, apparently you can’t take the risk of people snooping up on your privacy! It can end up in a disaster! Hence, if you are highly concerned with your privacy, you need to perform search history delete on a regular basis. You definitely don’t have to worry, as we’ll walk you through all the necessary steps on how to delete facebook search history on your PC. 1. 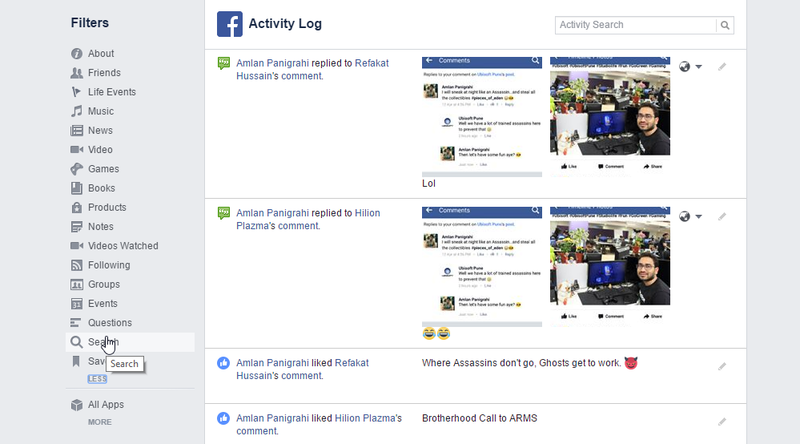 Log in to your Facebook account from any browser. 2. Click on the Facebook search bar. It will pop up your recent searches. 3. Click on the ‘Edit’ button. This will redirect you to your Facebook search history activity log. 4. 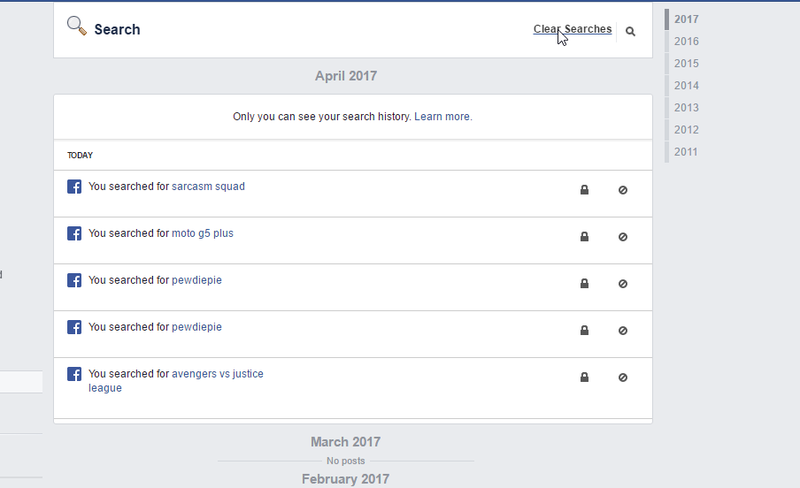 To delete your entire Facebook search history, you can click on the ‘clear searches’ option. If you want to clear search history individually, then you just need to tap on the warning button located next to each result, which you can refer from the image above. 5. Click on ‘Clear Searches‘ again to confirm deleting your Facebook search history. 6. You can now rejoice. Follow the above steps again, the next time you want to delete Facebook search history. 2. Click on the drop-down arrow located at the menu bar in the upper right corner. 3. On the scroll down menu, click on the ‘Activity Log’ option. It shall redirect you to the activity log page. 4. In the ‘Filters’ menu located on the extreme left, find the ‘Search’ option. You have to click on ‘More’ located at the bottom to reveal the option. 5. Click on the ‘Search’ option. It will lead you to the facebook search history activity log page. 6. Now can either choose to clear your entire Facebook search history, or rather delete recent searches individually. Alas, you are done with the important steps to delete facebook search history on your PC. You can also choose to delete facebook search history on your Android device. Remember that your activities are synced all together and hence, if you clear search history on one device, simultaneously, the same happens for your alternate systems. So, here are the steps if you want to know how to clear search history on facebook using your Android device. 1. Log in to your account via the Facebook app. 2. Tap on the search bar to unveil the list of recent searches. 3. Press the ‘Edit‘ button. It shall redirect you to the Facebook search activity log. 4. To perform an entire search history delete, tap on the ‘Clear Searches‘ button. 5. Press ‘Confirm‘ to clear facebook search history. 1. Tap on the menu bar. 2. Scroll down and tap on the ‘Activity Log’ option. 3. Click on ‘Filter.’ And then navigate to the ‘Search’ option. 4. Press the ‘Search’ button to unveil your recent searches. 5. Tap on ‘Clear Searches’ and then click on confirm to delete search history. 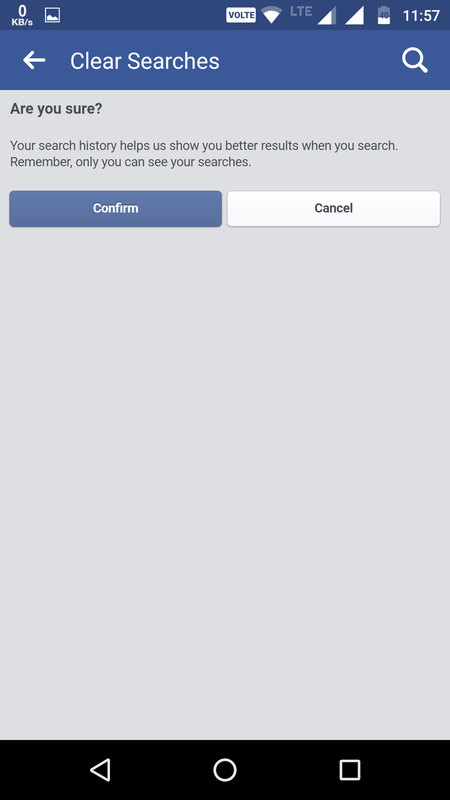 Hence, these were the necessary steps on how to clear facebook search history on Android. Q. When I click on ‘More’ in Filter menu located in the activity log, I get a list of apps. Where’s the clear searches option? Q. My searches aren’t getting removed even though I repeatedly tried to clear them. 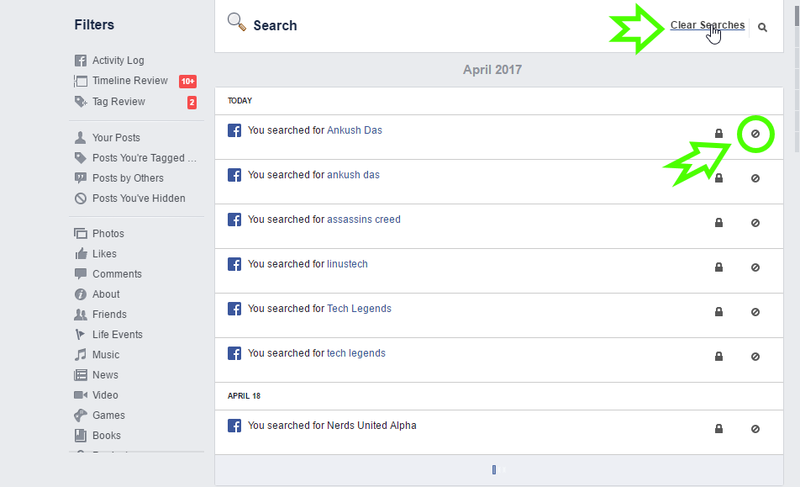 How to delete searches completely from the facebook search history activity log? Ans: Try implementing the 2nd method on how to clear facebook search history on PC/Android as mentioned earlier in the article. So, we guess there’s nothing to be afraid of if you follow our guide precisely on how to clear search history on facebook. 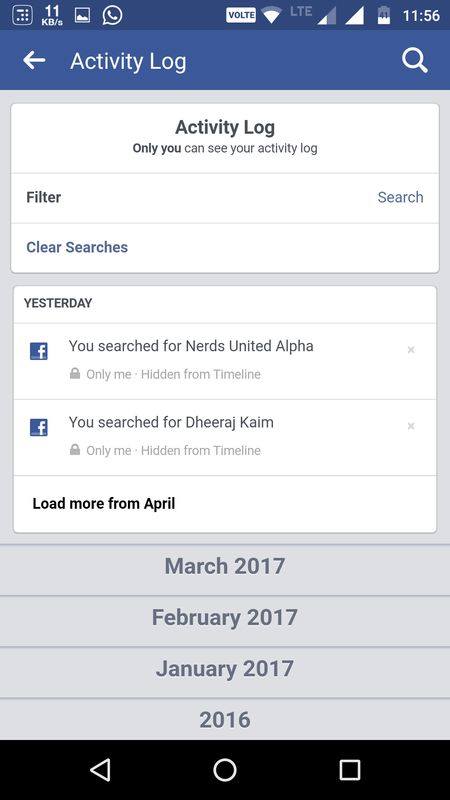 If you are still facing problems to delete recent searches on Facebook, let us know in the comments section below. We will surely help you out! Next articleMicrosoft’s Surface Laptop With Windows 10 S: Chromebook Killer? Good guide to clear search history on FB. Very helpful and useful to get started with privacy.